1  ‘Aubert Éditeur.’ Lithographic print drawn by C.J. 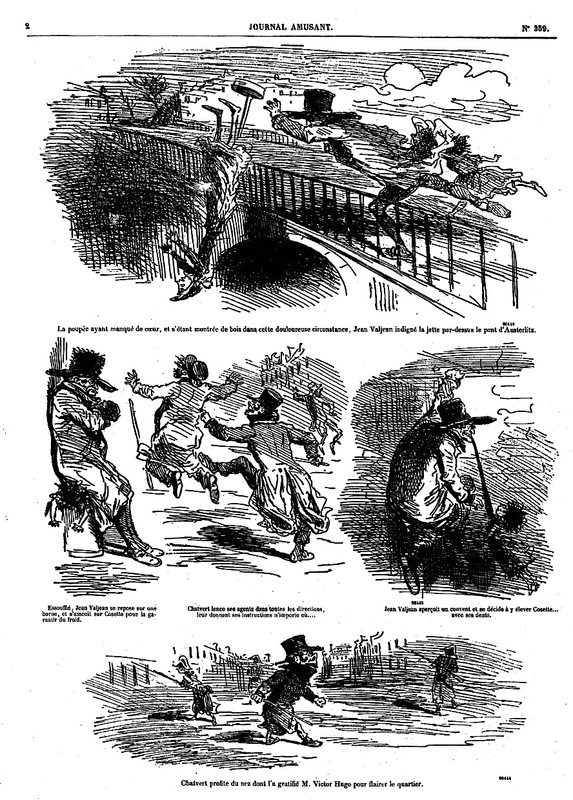 Traviès for La Caricature of December 22. “The Charivari is, therefore, the living expression of the Parisian mind – the mirror in which the current of diurnal fancy is reflected – the repertory of witticisms for stroll and soirée – the jester’s manual and laughing gas.” — Athenaeum, No. 714, July 3, 1841. CHARLES PHILIPON was born in September 1800, at the city of Lyons, and as a youth studied art in Baron Gros’ painting atelier where he met many of the artists who would supply him with caricatures in later years. He began his artistic career as a caricaturist on lithographic stone but his ambitions lay in comic journalism. 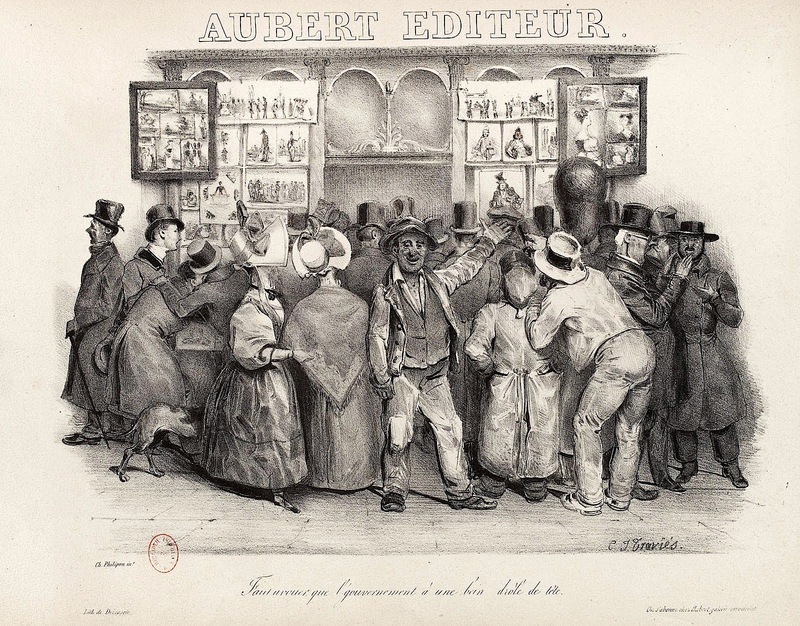 He was the brother-in-law of Gabriel Aubert (d.1847) whose name would supply the title for Philipon and Aubert’s publishing house, Maison Aubert or Aubert et Cie.
Philipon published some great caricaturists in his many comic journals, now famous names: artists like Honoré Daumier (1808-79), Sulpice Guillaume Chevallier, signing Gavarni (1804-66), J.J. Grandville (1803-47), C.J. 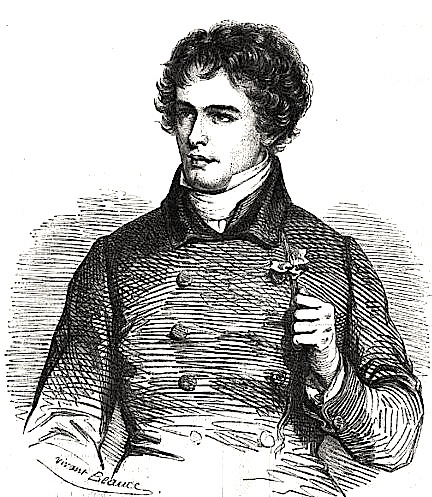 Traviès (1804-59), Amédée Charles Henri de Noé known as Cham (1818-79), and later Gustave Doré (1832-83). Almost all were bohemians in rebellion against the stiff conformity of the Academy and the Salon. 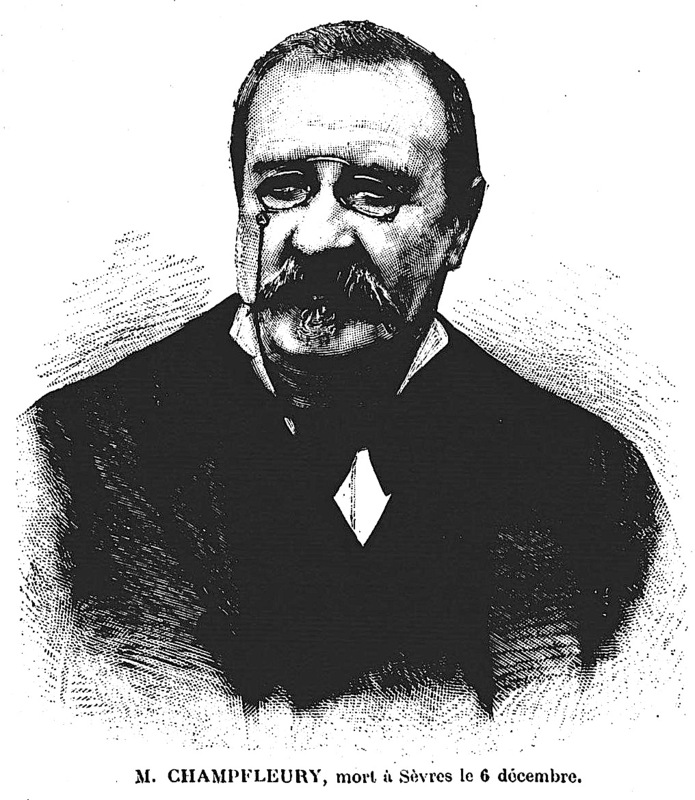 Writer Champfleury (1821-89), who became an eminent historian of caricature, was also in Philipon’s circle. 2  Charles Philipon. Photographed by Nadar (detail). LA SILHOUETTE. 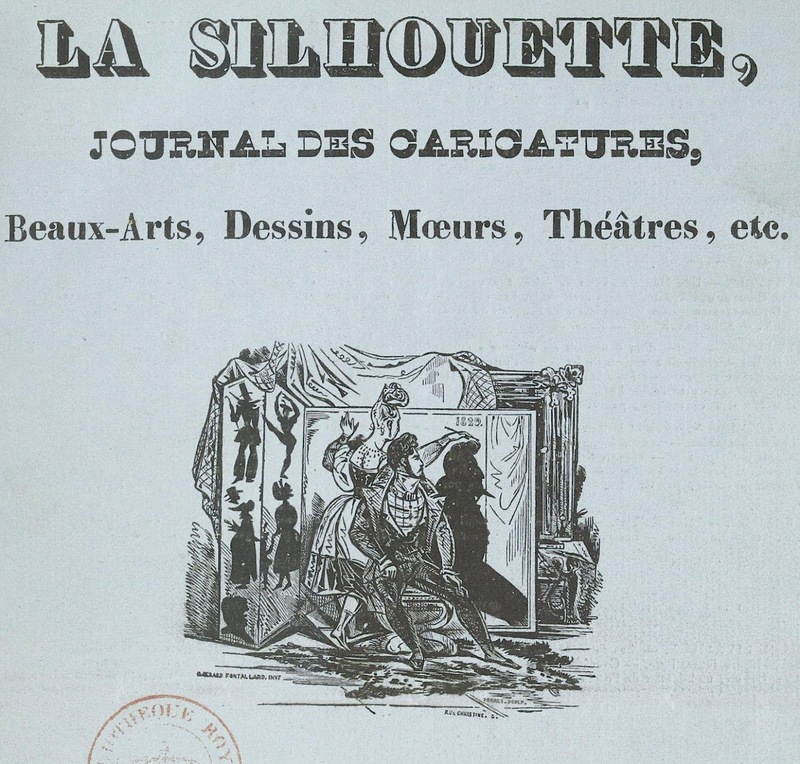 Philipon’s first experience with publishing in the late 1820s was when he joined the staff of La Silhouette — the first French periodical paper (preceded by The Glasgow-based Looking Glass in 1825) to utilize the lithographic process and the use of caricatures, some in full color — launched on October 31, 1829. It ran until 1831. With the discovery of lithography (made by Aloys Senefelder at Prague in 1798) a new reproductive method became available of drawing directly on to a lithographic stone. It was based on the mutual antipathy of water and grease, drawing and washing could be done with pencil, crayon and ink. Around the same time cheaper paper and mechanical presses were introduced throughout Europe. Artists also worked out how to transfer sketches done on paper by rubbing the outlines of them onto the stone. 3  La Silhouette. Cover to bound Volume 3. LA CARICATURE. 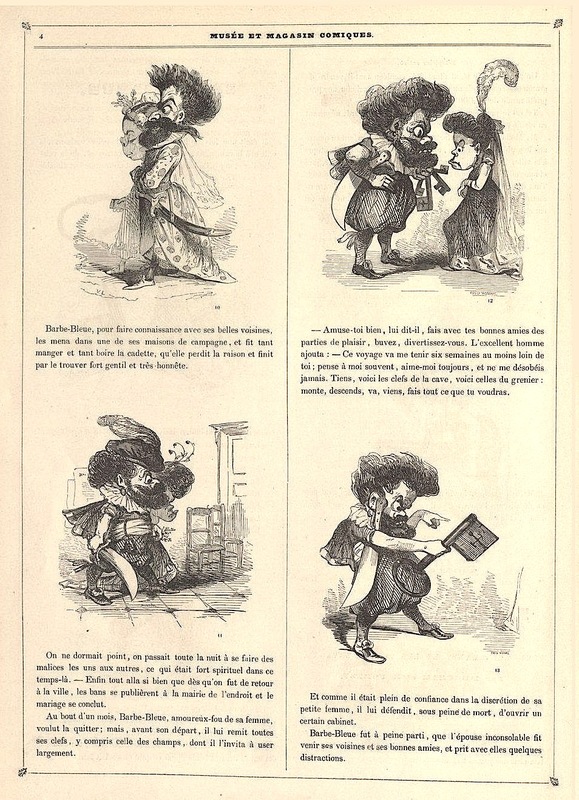 Philipon’s first paper under his complete personal control was a weekly title, La Caricature (subtitle: ‘Morale, Religieuse, Littéraire et Scenique’). No. 1 was published November 4, 1830. It consisted of four pages of text and two separate lithographic inserts. The chief artists were Honoré Daumier, Henri Monnier and Charles-Joseph Traviès. 4 [1835-39] Illustrated titles. March 12, 1835, and a later version of December 27, 1839. 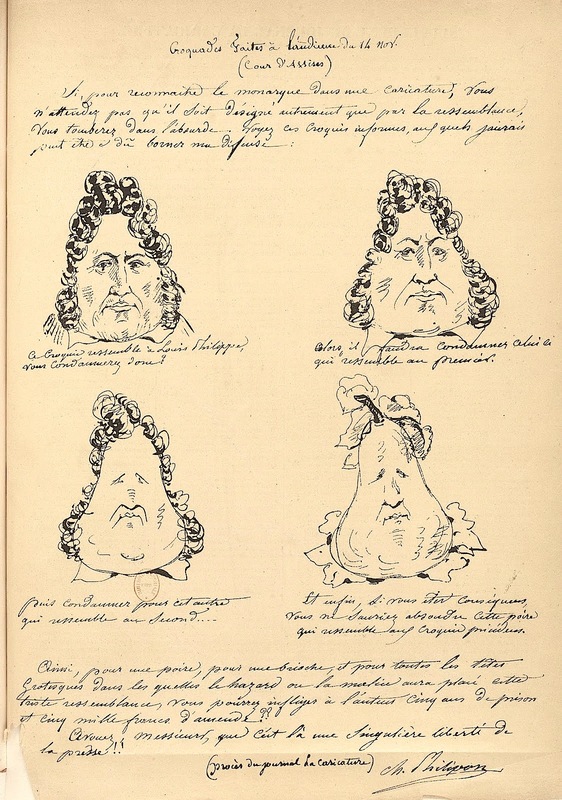 AS EDITOR Philipon came up with the idea of caricaturing the French King as a common pear which in French argot had a double meaning of “fool” or “simpleton.” The pear, easy to draw, was the subject of hundreds of caricatures in 1830-35, and became a favorite graffiti, chalked all over the walls and surfaces of Paris. Restaurant pears became subject to masticated regicide, plays and songs were written on the exploits of the pear, the lithographs were hawked in the street by criers. 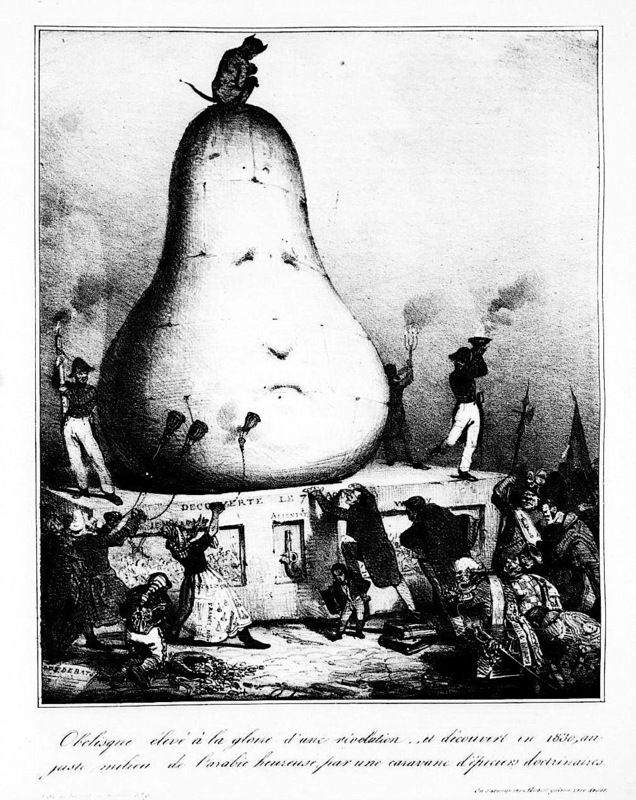 The King — Le Roi Louis-Philippe — in the eyes of the public, became the pear. The pear stereotype also made an appearance in Philipon’s daily companion paper Le Charivari, begun in 1832. SUPPRESSED in July 1835 after an attempt on the life of the King, La Caricature fell silent for three years. An anarchist and police spy named Joseph Fieschi had built an infernal machine consisting of 25 gun barrels on a frame, an ingenious automatic weapon which left fourteen dead, twenty-six wounded — and the King unharmed. 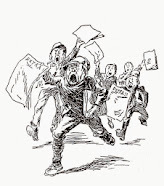 Legislation was passed which effectively killed freedom of the press in France until 1848. Philipon’s reaction was to turn the focus of his comic journals and caricatures from politics to amusement. 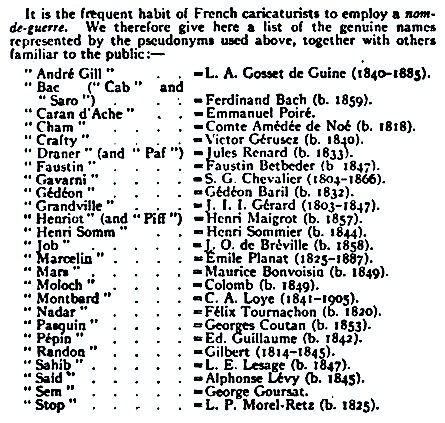 La Caricature eventually reappeared in 1838. 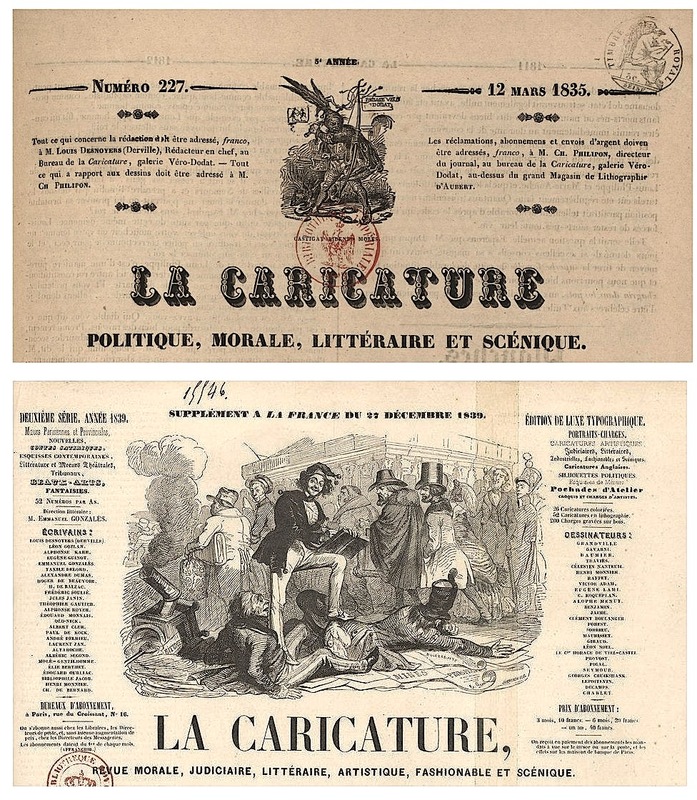 First as La Caricature provisoire, since July 1839 with the subtitle: ‘morale judiciaire, littéraire, artistique, fashionable et scénique,’ and finally subtitled: ‘La caricature, revue satirique des modes, des théâtres, de la musique, des tribunaux et de la littérature.’ The last issue appeared on December 31, 1843. 5  Pear head. 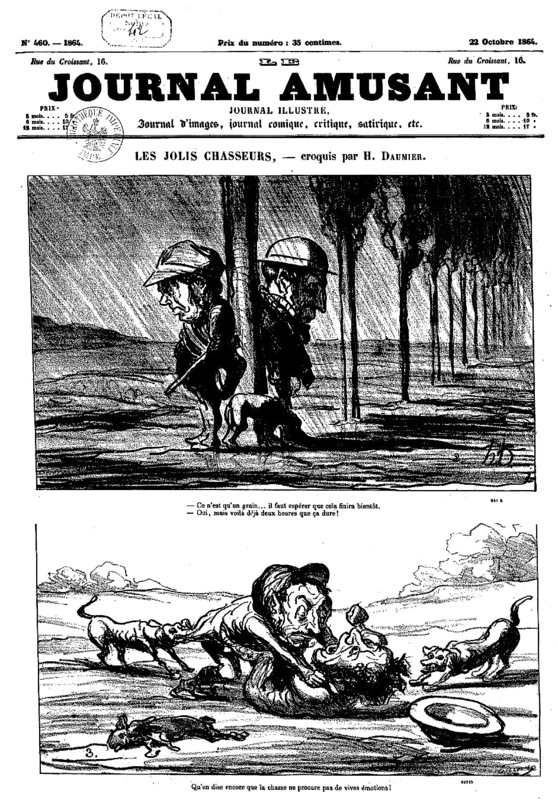 Drawn by Auguste Bouquet for La Caricature, August 27. LE CHARIVARI. Aubert et Cie.’s second title, the satirical Le Charivari, France’s first daily illustrated paper, was already founded by Philipon and French writer Louis Claude Joseph Florence Desnoyers on December 1, 1832, as a companion title. 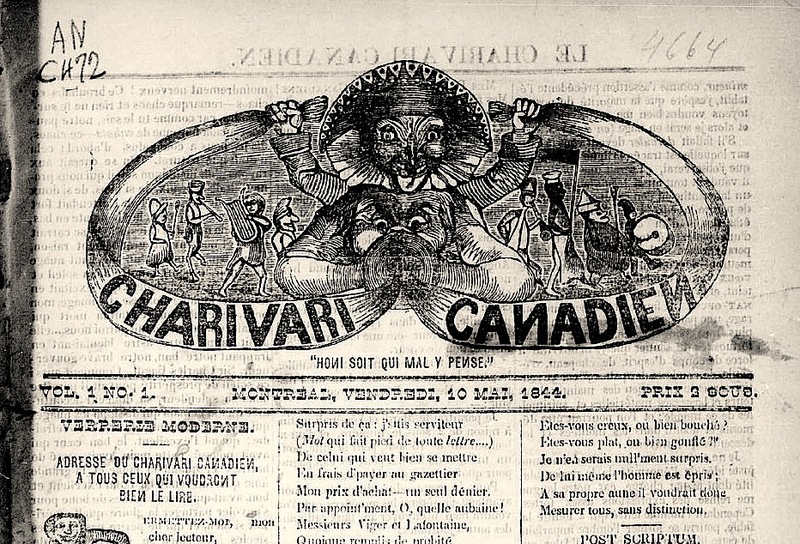 (England’s 1841 Punch, or the London Charivari paid its tribute by using the name as a subtitle; a Charivari Canadien was published at Montreal in 1844.) Philipon’s Le Charivari survived well into the 20th century. In July 1832 he already launched a print of the month club, L’Association Mensuelle. 6  Le Charivari, July 1. Title illustration by J.J. Grandville. 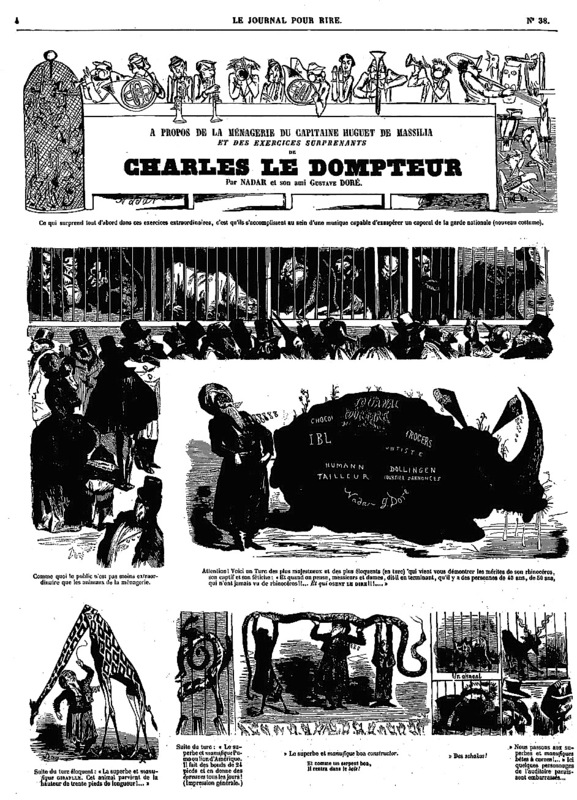 ISSUED DAILY, Le Charivari originally consisted of three pages of text and one lithographed print. Unlike the seperate inserts of La Caricature, the lithographed drawings and the letterpress text were integrated directly into the paper in two separate print runs. Woodcut engraving was used for the smaller inset illustrations. 7  ‘Obélisque.’ By an unknown caricaturist in Le Charivari, March 13. 8  Charivari Canadien. Vol. 1, No. 1, May 10. Possibly, in France, but this comic style was already common in England in 1825 in the Glasgow Looking Glass and in woodcut broadsheet ‘comicalities’ from Bell’s Life in London, and Sporting Chronicle (1827). 9  ‘Histoire de Feu Barbe-bleu.’ In Musée Philipon, “mise en images” by Cham and Edmond Forest. MUSÉE PHILIPON. From 1842 to 1843 Aubert published 48 issues of Musée Philipon in 2 Volumes. Its full title was Musée ou Magasin Comique de Philipon; it contained picture stories by Cham, Daumier, Dollet, Eustache, Gavarni, Grandville and Vernier. The famed pastoral painter Charles Jacque also contributed. The publication was discontinued with number 48 and replaced by a new publication, La Lanterne magique d’Aubert. 10  Musée Philipon. Front page. LE JOURNAL POUR RIRE. The first number of Le Journal Pour Rire (subtitled: ‘Journal d’images, journal comique, critique, satirique et moqueur’) was published as a specimen number issued in December 1847, followed by No. 1 on February 5, 1848. On large-sized newsprint with woodcut engravings. 11  Le Journal Pour Rire. Saturday, August 14, comic cover story drawn by Marcelin. 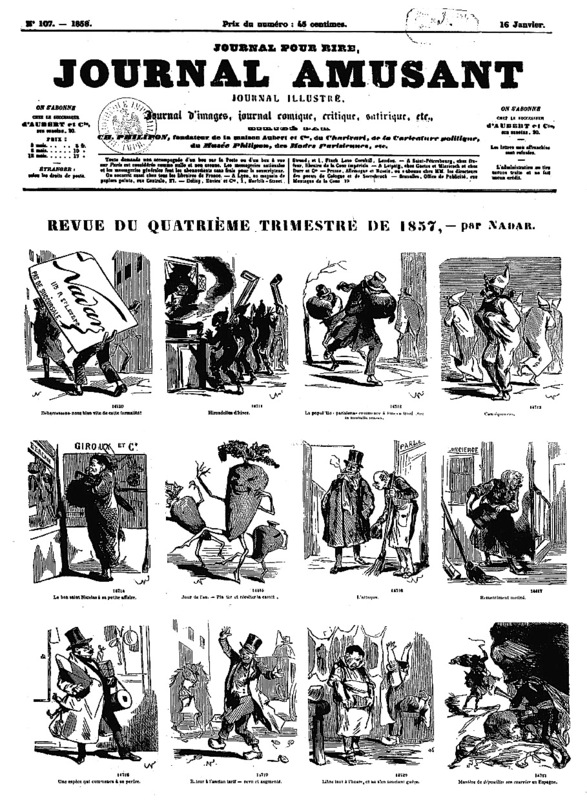 The sheet-size of Le Journal Pour Rire changed on October 3, 1851, and the next issue was labeled ‘No.1,’ with a cover featuring nine smaller comic drawings (woodcut engravings) by Nadar under the title ‘Revue du Troisième Trimestre de 1851.’ This became a ‘Suite,’ a yearly continuation, filling the full 8 pages with a total of 97 caricatures. 12  Le Journal Pour Rire, No. 30, April 23. ‘Lanterne Magique des Auteurs, Journalistes, Peintres, Musiciens, etc.’ Comic portraits of all contributors to Aubert’s papers, as drawn by Nadar (detail). Nadar (author’s name of Gaspard-Félix Tournachon, 1820-1910), became a well-known photographer and aeronaut, and was a prolific caricaturist in Philipon’s papers, although there were better artists. 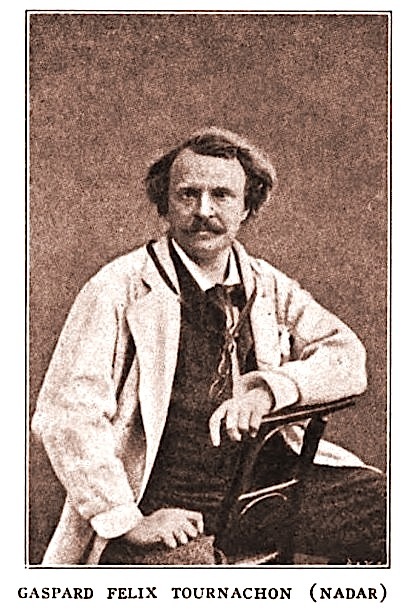 In 1862 Nadar collaborated on pages full of comic drawings with fellow artists Darjou and Gustave Doré. The same style and format were still in use in Nadar’s dying year 1910. 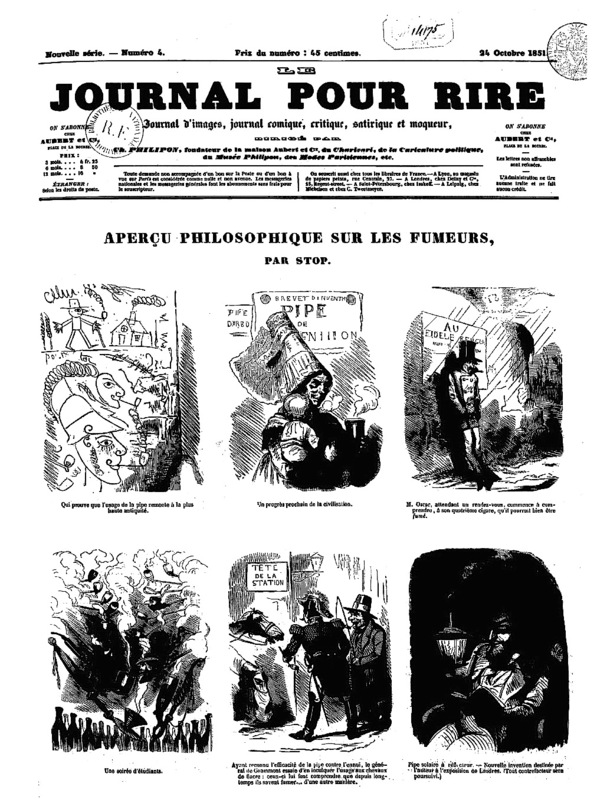 13  Le Journal Pour Rire, June 19, by Nadar and Gustave Doré. 14  Le Journal Pour Rire, October 21, a comic by Stop. Introducing Vivant-Beaucé. In Le Journal Pour Rire No. 8 of November 21, 1851, appeared ‘Règles de la Civilité Puérile et Honnête; Souvenirs de l’École des Frères’ by writer Ernest Bourdachut and illustrator Vivant-Beaucé (1818-76). Souvenirs of a boys’ school that came close to a full-blown comic strip. Four ‘chapters,’ spread over 3 pages, were included in No. 8 with three more chapters in the following No. 9. This remarkable story, a comic story in pictures, followed a rather wild French school boy on a day through Paris, ending with an over-indulgence in eating, a fitful sleep, and nightmares. 16  Le Journal Pour Rire, November 28, comic strip by Bourdachut and Vivant-Beaucé. The comic story’s sequel is also notable for the lead character’s movements which are depicted with great fluency as he slides down banisters and climbs out windows. Most of the French cartoonists artwork was rather stiff and lifeless at that time. No. 27 of April 2, 1852, had a comic picture-story about an artist in ‘L-Atelier.’ Doré, Marcelin, and Valentin occasionally drew character-driven stories. 17  Le Journal Pour Rire, November 28, Bourdachut and Vivant-Beaucé. 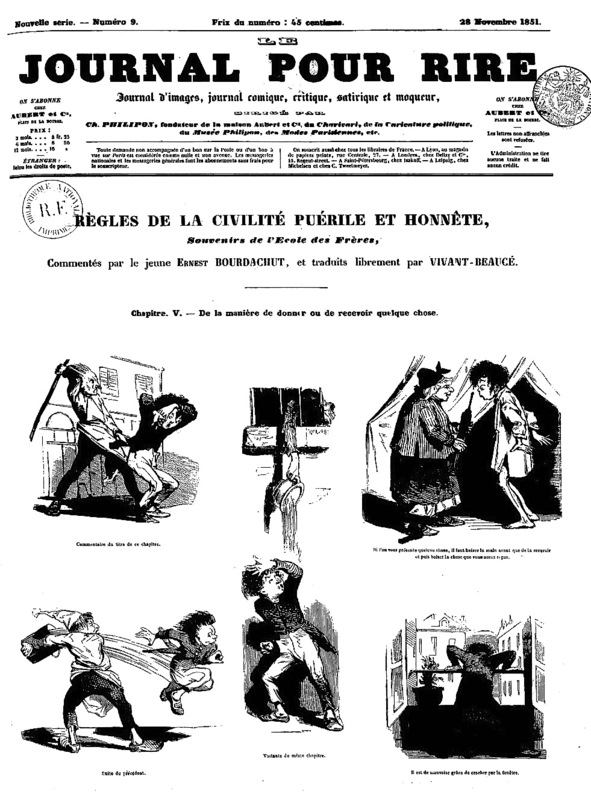 ‘Règles de la Civilité Puérile et Honnête’ may be one of the earliest homegrown French comic strips. I haven’t seen a precedent in Philipon’s comic journals before November 21, 1851, yet. 18  Nicknames and pseudonyms. 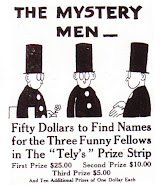 From the Encyclopedia Britannica ‘Caricature’ entry (detail). 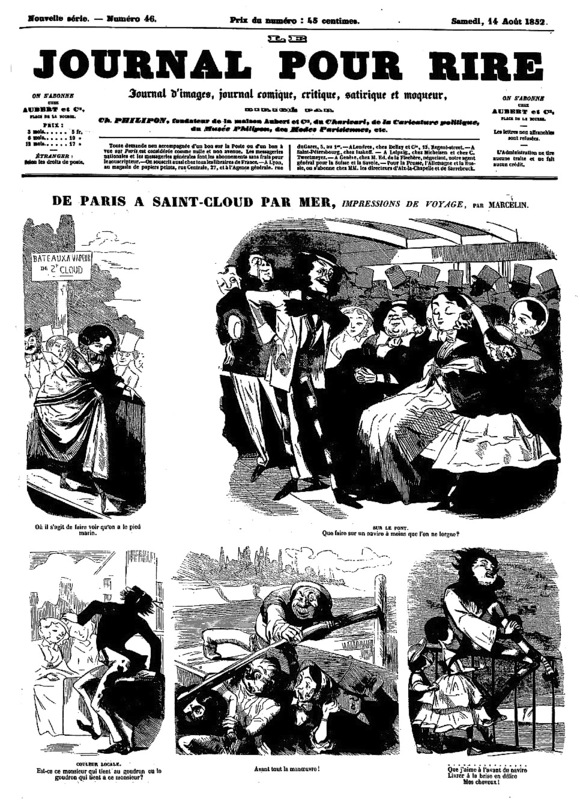 PUNCH À PARIS. 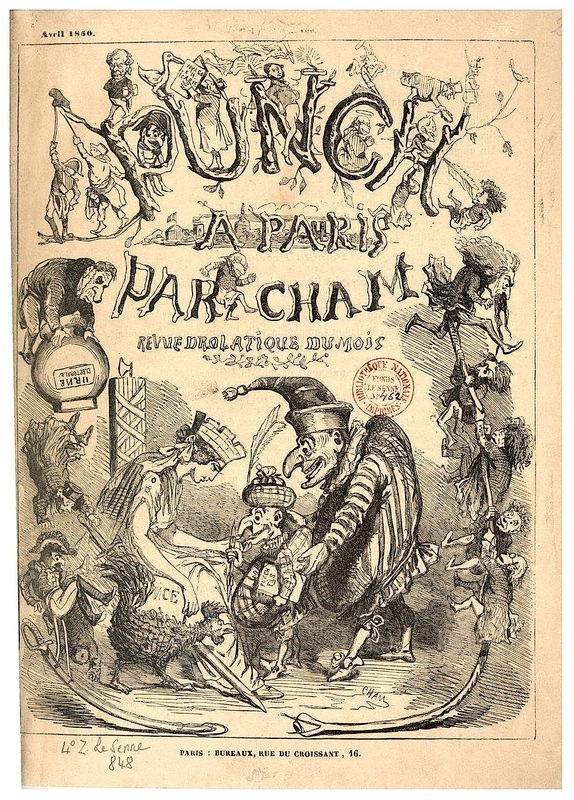 1850, a monthly designed and illustrated by Cham, starred the Punch mascot under a Richard Doyle-like cover. It lasted six numbers. 19  Punch à Paris, April cover by Cham. JOURNAL AMUSANT. 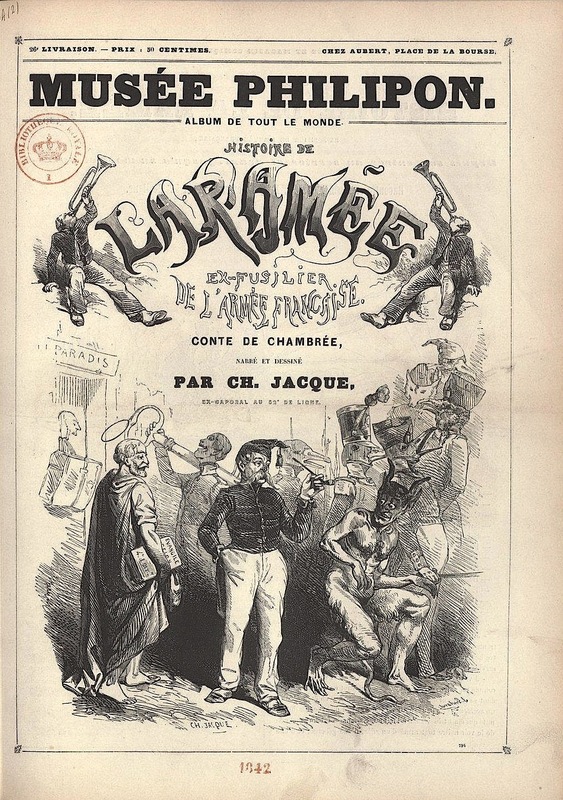 After eight years Le Journal Pour Rire was retitled Journal Amusant on the cover for January 5, 1856, although the old title remained at first in smaller type. This Journal Amusant became Philipon’s most enduring publication, lasting until at least June 20, 1933. Many of the artists from Le Journal Pour Rire followed, including Nadar, Stop and Marcelin. 20  Journal Amusant, January 16, the yearly ‘suite’ with nine drawings by Nadar. 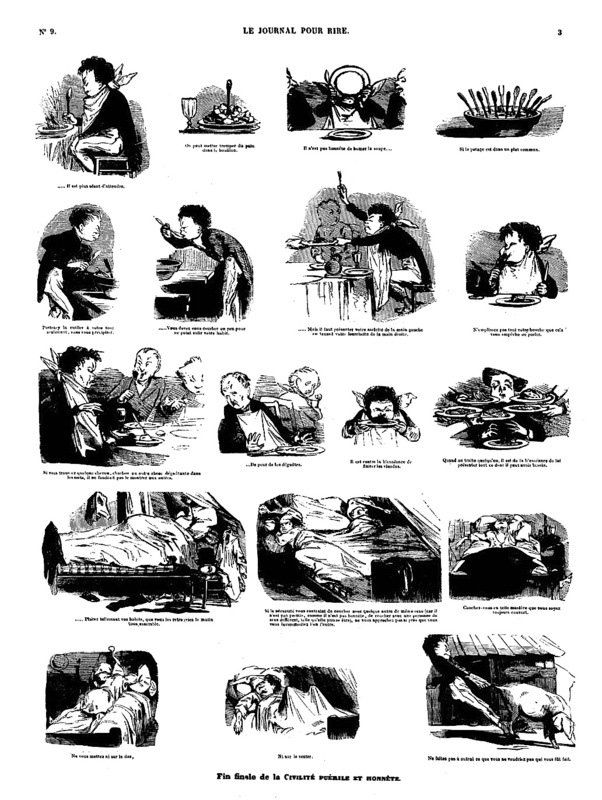 One Victorian picture story of note from the Journal Amusant was a loose, cockeyed adaptation of Hugo’s Les Misérables by Cham which ran in ten parts from November 15, 1862, to No. 377, April 4, 1863. Pages filled to the brim with smaller comic drawings, near comic strips sometimes, held pride of place in the Journal Amusant until 1895 picture stories and strips by Caran d’Ache and Bernard Rabier became more prominent. 21  Journal Amusant, November 15, comic by Cham. 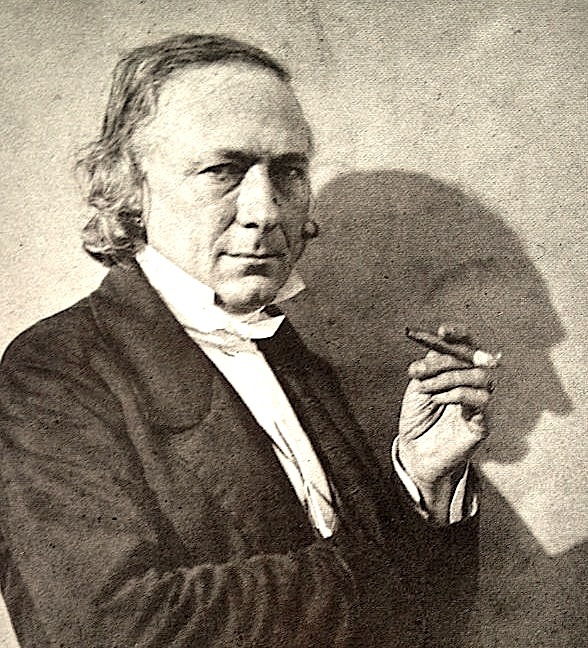 CHARLES PHILIPON, caricaturist, editor, publisher, died on January 25, 1861. His name remained as proprietor and publisher for quite some time. By 1862 the proprietor appears to have been M. Philipon, fils, followed shortly by Eugène Philipon with editor Henri Plon. Proprietor in the 1890s was Paul Philipon. 22  Journal Amusant, October 22, by Daumier. 23 [1890s] Nadar. Photograph in The Bookman, 1931. 24  Champfleury. Portrait from Voleur Illustre, December 12. Thanks to the French repository Gallica. See more of Charivari Canadien HERE. Gostaria de acrescentar que Cham também trabalhou na revista "L'Illustration, Journal Universel"